In the early 1970s, after a successful career in the leather industry in the region of Millau and asglovemaker in Paris, Aimé Guibert had a life-changing vision of a wine project in the town of Aniane in the Languedoc that was to become the Mas de Daumas Gassac. He also had the clairvoyance to bring a group of wise wine kings to peer into the cradle of it and give their blessing and bestow their advice. This included from Bordeaux the soil specialist Henri Enjalbert, professor of geology at Bordeaux University, as well as Emile Peynaud, legendary oenologist from the same region. Guibert would later dedicate a special bottling made from 100% Cabernet Sauvignon grapes to the latter in 2001. 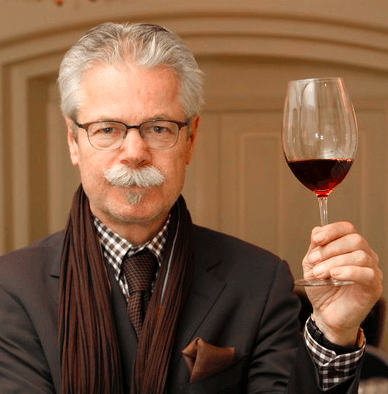 Guibert had a savvy sense of marketing and was clever to lobby from the start the British wine writers who dominated the wine world in the late 1970s, Hugh Johnson and Michael Broadbent. The former gave the Daumas Gassac red a welcome moniker as the “only Grand Cru of the South” while the latter proclaimed it to be “one of the top 10 wines in the world”. A tale often recounted during those heady early days of Daumas Gassac’s success in the British market bears retelling. After tasting the red for the first time in London, Hugh Johnson was so entranced by it that he hoped to impress Michael Broadbent with a blind tasting of this new, unknown wine. Broadbent took just one glance at the dark robe and one sniff before identifying it as Daumas Gassac, much to Johnson’s amazement (and perhaps chagrin!). It turned out that Aimé had covered all his bases in the UK already and served the wine to Broadbent only the week before. Forty years after that first, landmark vintage, the wines of Daumas Gassac, without the oversight of Aimé who died in 2016, continue their stride as wines of unusual aging capacity, and thus confirming their worthiness as a grand cru of Languedoc. As noted recently by Samuel, one of Aimé’s four sons (the others being Roman, Gaël, and Basile), the Guiberts believe that the sign of a grand domain is having a vinothèque, or wine library, of old vintages that can be shared with valued customers. Not many estates have that capacity in the Languedoc. The tightly-knit family has even boosted their library collection, now setting aside up to 3 000 bottles of the red, and 1 200 bottles of the white, destined to be aged 10 years at least before a commercial release with a dedicated label. 2006, 2007, and 2008 are currently available. To demonstrate this exceptional capacity of their wines for such aging, Mas de Daumas Gassac organized in 2014 on the eve of the wine fair Vinisud a vertical tasting of 30 vintages for the red wine, ranging from 2012 to 1979, the last being the second vintage produced after the birthyear 1978. This year, for the fortieth anniversary of that initial vintage, another, albeit larger, group composed of a happy few tasters – mainly the usual suspects of the European wine press – took the road to Daumas Gassac, again on the eve of Vinisud. This time the place of honor was accorded to the singular white wine, presented in 23 vintages over a thirty-year stretch, ranging from 2017 to 1987. It was a profoundly fascinating tasting experience but also an illuminating one. It shone a welcome light on an essential aspect of the production of Daumas Gassac that is sometimes, if not overlooked, at least somewhat neglected in accounts of the domain that invariably underline its Bordeaux-influenced legacy. From its beginning, Aimé Guibert had a vision for Mas de Daumas Gassac, located in a small valley near the town of Aniane, a site suffused with a magical, intensely-felt ambience, coming as much from the enchantment of the surrounding forest and garrigue as from the hillside vineyards. * It was to be a haven for a library of vines composed of a multitude of grape varieties. The red grapes alone have a large varietal palette: in addition to the Cabernet Sauvignon cornerstone, there is Cabernet Franc, Malbec, Merlot, Tannat, Petit Verdot, Carmenère, Syrah, Pinot Noir as well as ten other rare, more obscure cultivars. The white grapes are just as diversified: from France comes Viognier, Chardonnay, Petit Manseng, Chenin Blanc, and fourteen others, including Bourboulenc, Marsanne, Roussanne, three types of Muscat, Gros Manseng, and Semillon. They are joined by Falanghina, Fiano, and Grechetto Todi from Italy, Neherleschol from Israël, Petite Arvine and Amigne from Switzerland, and more. The most astonishing “outsider” grape is from the island of Madeira, Sercial, bringing if only a hint to the wine its racy, even sharp, acidity. The first four form the foundation, composing up to 90% of the wine, but the grace notes added by the others impinge discretely but delightfully on the aroma and texture. One of the fun features during the vertical tasting was trying to untangle the aromatic and textural components in relation to the grape varieties. Was that phantom, pungent whiff and snap on the palate a calling card left by Sercial? That musky floral perfume, was it from which three of the Muscateers, Muscat Petit grain, Muscat d’Alexandrie or Muscat Ottonel? With bottle age, the musical chairs played by the different varieties was just as fascinating, as often the four foundation grapes seemed to take a back seat after clearly dominating in the young vintages. This was particularly the case for Chardonnay and Viognier, as noted by Andrew Jefford during the discussion. The conditions of the tasting were impeccable and carefully thought out. Given the high number of tasters present – compared to the red tasting in 2014 where all the pours came from a single bottle – two bottles from each vintage were brought up from the cellar the evening before to rest standing up in a cool storage area (4°C), before being uncorked at 10 o’clock on the morning of the tasting. Such a deliberately cool service temperature was to compensate for a significant rise in temperature in the tasting room, calculated to be 10° over 30 minutes. The tasting began at 2 P.M. so the bottles had been opened for four hours. All 46 bottles had their original corks. Most of the wines had masses of fruit and suave textures with underlying residual sugar, a deliberate choice of the Guibert family for the house style, but tension was also present in the best examples of Daumas Gassac white. Indeed, it was remarkable how much balance and digestibility the wines maintained despite the at times considerable cargo of residual sugar. Another hallmark characteristic is the textural, phenolic structure of the wines which undergo skin contact, and which gives a distinctive chewiness on the palate. Their “vibrant plushness” makes them undeniably superb gastronomic wines to serve at the table, but equally enjoyable all on their own, especially while sitting in the fading light of the Aniane valley on a summer evening. The two most recent vintages, 2016 and 2017, are nonetheless game-changing vintages incarnating an evolution towards less residual sugar in the wines, and a greater emphasis on freshness. And yet, freshness was omnipresent throughout the tasting, with less oxidative character in the ranks than one might have thought, and nearly all the wines attained the holy grail of delicious drinkability. The tasting was followed by a discussion session during which each taster was asked to make a few comments and name his or her quintet of favorite vintages. Most participants gave free rein to a very widely-shared enthusiasm. Nevertheless, as is usual with such a range of tasters differing in age, experience and geographical origin, it was not surprising how different the preferences were, with the majority seeming to give the edge to the younger or slightly mature vintages. No one wine managed to obtain a majority of the preference votes. All but one vintage (2003) received at least one vote, while 2000 received the most. My choices for personal favorites went to one ex aequo or tie vote for the two most recent vintages, 2017 and 2016, in recognition of their “new wave” lightness of touch and focus, then to four older vintages – 1998, 1993, 1990, 1988 – for their savory complexity allied to a remarkable freshness. In this, I was joined by the Italian Franco Zilani who also had a predilection for the older vintages partly out of a feeling of solidarity with them! *Let us tip our hat to the crucial role of Véronique de la Vaissière, Aimé’s wife, who left her own indelible stamp on Mas de Daumas Gassac when she threatened her husband with divorce if he were to rip out a single tree from the valley, leading to the choice of cultivating numerous pockets, or clearings, of vines here and there around the large property. The wooded environment reinforces the coolness of the valley itself which plays a crucial role in the freshness of the white tasted. In 2017, the stylistic shift already evident in the 2016 is even more apparent here, with a remarkably fine and delicate nose of floral-scented yellow fruit. No one grape variety seems to dominate here, aside from a fleeting Muscat note. Although the palate has its usual plenitude of fruit, there is great poise and vibrancy, and a finish that affirms the key role of Petit Manseng in the mix (33%), with touches of quince and pineapple. A vintage marked here by stylistic shift toward more freshness and tension by lowering the residual sugar to around 5 to 6 gr/l, although the nose remains quite rich in style, and the mouthfeel has a lip-smacking sweet and chalky chewiness to it. An undercurrent of quince fruit suggests a Chenin-based wine, but it is the Viognier that is the dominant component (27%). Outstanding wine. The discrete nose has a candied quince fruit nose complicated by herbal scents. Quite full texture on the palate with a zesty, lemony finish. Quite a luscious nose of quince, followed by a rather plush attack. A midpalate of steely white fruit gives an impression of minerality, but a bit more vivacity on the finish would be welcome. Lots of very ripe Chenin character on the nose with a scent of cooked apple and candied citrus fruit, but also a hint of butterscotch. Viognier is the dominant grape in this wine (33%). Although it has less of residual sugar (6,9%) than was the custom at this period, the wine seems at this stage a wee bit less balanced than other vintages. Discrete but intriguing nose of infused herbs, notably verbena, lots of full, chewy texture on the palate with apricot and citrus fruit. Despite the generous portion of Petit Manseng (26%), the acidity takes a back seat in its current phase, but it remains a refreshing, balanced and delicious wine. First wine of the tasting with a real change of profile due to bottle aging. The nose is quite evolved with candied fruit of kumquat, peach and apricot, and a hint of “petrol.” Round texture on the palate but a touch of heat on the end, with the alcohol asserting itself. Ravishing nose that is both rich and delicate in expression for its spicy citrus and apricot fruit scents. A rather tannic mouthfeel, with an unusual touch of austerity but also lots of finesse. In the context of this vertical tasting where a certain vibrant plushness is the rule, this is a more discrete, even strict, but still superb expression of a Daumas Gassac white. If the 2008 was discrete in its expression, the 2006 is almost mute in terms of initial bouquet, but with a similar touch of austerity on the palate, despite the notes of candied quince. Medium body, less complexity than others, but has what the French call “de beaux amers” or an appetizing, bewitching bitterness on the finish. The color is surprisingly light in hue compared to its immediate neighbors in the glasses. At first quite reticent in expression, and light-bodied with bitter orange, apricot and hints of tea on the palate. Quite delicate despite a hefty portion of Petit Manseng (39%). This is the vintage when Chenin Blanc was first added to the mix. Very reticent expression of candied orange. This was the least successful wine of the line-up, lacking balance and depth, but it remains quite pleasant to drink. Very deep copper hue to the robe, lots of bitter orange and cooked apricot on the nose, along with some salted caramel on the palate, and a grace note of orange blossom on the finish. Perhaps high yields that year explain a certain lack of depth, but it remains balanced. 30% Chardonnay for this vintage. Bronze orange hue, very full-bodied nose, rather opulent wine of candied orange with a hint of rancio. Despite its intensity and 7,9 g of residual sugar, it has finesse and balance and a long, salivating finish. Superb wine. Endowed with the highest amount of residual sugar for all the wines presented (16g/l), this is another example of the opulent style for a Daumas Gassac white with cooked apricot, but it is a bit monolithic in style. Lots of alcohol and acidity on the palate, and once again, a pretty note of orange blossom on this finish gives it a bit of panache lacking on first impression. Opulent style once again but enhanced by good precision for its apricot fruit and sustained by a finely-etched frame of chewy substance and acidity. Long salty finish. An early harvest at the end of August for this wine, with remarkably low amount of residual sugar for this period, only 1.3 gr/l. A streak of greenness insinuates itself into the frame of bitter orange fruit. Very pleasant wine albeit lacking in intensity and focus. Very singular nose, quite floral with hints of jasmine, also orange and apricot. Spicy, candied apricot on the palate, and seductive oxidative, sherry-like and balsamic notes on the finish adds to its digestibility. Very savory wine. Very light colour in the context. The most “Sauternes” like on the nose, complex, rich and spicy, and then a lovely attack on bitter orange, followed by very fresh finish. A large dollop of Viognier for this wine, 47%! Lovely amber color, rich but focused nose of apricot, little sucrosity on the attack, very much nutty, stone fruit feel and taste on the palate, very lively, juicy and salivating finish with a thread of sherry-like character. Remarkable wine. Astonishing wine, although still expressing itself with restraint, especially on the nose. Some jasmine oil on the palate as well as a hint of molasses. Quite a chewy texture, long and savory finish. At 30 years old, this was the most tired wine of the line-up, lacking focus and tension, but remains honorably pleasant to drink.